Snow may not be falling from the sky where you live but with this craft you can make it a white winter regardless of the weather! 1. Cut a piece of white construction paper to make a square (4” to 9” squares work well) 2. Fold opposite points of the square together making the paper into a triangle. 3. Leaving the paper folded, fold the other two points together. 4. With the paper still folded, cut off the corners. 5. Cut designs into each side of the folded paper between where the points were. Unfold the paper to see what your snowflake looks like. The finished designs are what my children and their friends came up with. By hanging these pretty geometric shapes around the house, displaying them in windows, and using them to decorate gifts, you’ll quickly bring a festive touch to your home! 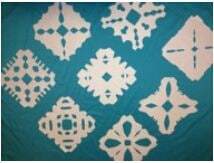 Send us pics of the snowflakes you and your children make as well as how you'll use them, and we’ll be happy to display them on this site!